Shipping containers seem to be ubiquitous, even more so when you're in need of one. During the course of a normal day you may pass by them in the street, drive by a shipping container riding on a chassis as it cruises down the highway, or even notice that construction site that you've passed five days a week for the last six months is loaded with converted shipping containers - on converted shipping container office, and several modified shipping containers being used as portable storage containers. The burning question that people typically ask is, "where can I buy a shipping container at a cheap price?" 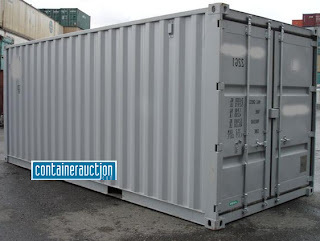 As with anything, when you begin shopping for used shipping containers the first thing to do is find a few prices and compare them. Your definition of "cheap" may be greatly different than someone else's. Many container traders and retail locations have websites, but they don't always provide online pricing (keep in mind; these are typically container depots and terminals, and typically not people that spend their entire day behind a desk). If you don't have any luck finding a local business that sells used shipping containers, the next stop is to visit an ecommerce website that sell shipping containers. The first obvious choice is eBay. There are a usually a few shipping containers listed on eBay, but the inventory tends to be limited and centered in only a few specific areas. The next choice is ContainerAuction.com. ContainerAuction.com specializes in used shipping containers, and many companies (some of which may be local to you), have accounts on ContainerAuction.com and either list their used containers on the site, or you can contact them directly through the site to inquire about their inventory. To help you get the best price on new or used shipping containers, you'll want to have a few bits of information ready to share with the company selling the container. How long do you want the shipping container to be? What do you plan on using the shipping container for (storage, housing conversion, shipping)? Do you know what condition you need the container to be in (typical conditions are "cargo worthy", "wind/water tight", "one trip", and "as-is, where is". Will you need the container to be delivered? If you need the container delivered, do you have a forklift on site, or will the truck need to drop the container to the ground? Obviously, location and condition are the two biggest factors in shipping container prices. An "as is where is container", which is the lowest grade condition, will be much less than one that's "cargo worthy". In most circumstances, you'll want to find a container that's at least in wind/water tight condition. You can expect a 20' used shipping container in wind/water tight condition to be at least $1500 anywhere in the United States or Canada. If you find one that's less, be sure to inspect it closely - there may be problems with it. If you have those questions answered and do a little homework, there's no doubt that you'll be able to find a used shipping container for sale. We are a registered charity in Brazil saving street dogs. We were forced to move our shelter when we lost everything after the 2011 floods. We need three shipping containers to help us rebuild the shelter and our home which is on site. Anybody have any ideas who may donate shipping containers and how we could get them to Rio Sth America? I know it's a long shot but we are paying rent since losing our own home and this is money that could be used for saving lives instead. Our work is here http://www.youtube.com/watch?v=NQGjCKYU3lE&feature=plcp Fb page called 'Dogs in Brazil' I am English and have been rescuing dogs for over a decade. Please can anyone help? I will bump up this post so I hope some readers can help as well as Tweet this for you. Shekinah Enterprises and All Steel Structures LLC. Let us meet your storage equipment needs today!